The cover image is by Joshua Neves and Graham Bury. It is exciting to discover a new poet and a new press. Megan Fernandes is a sophisticated and sensitive writer, and her poems are, by turn, surprising, vivid and affecting. 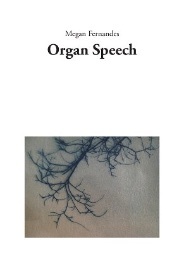 Organ Speech is unnervingly good. Read more of Charles Whalley’s piece in Sabotage Reviews.